To make the syrup, combine sugar, water, lemon, cinnamon, and cloves in a large saucepan and bring mixture to a boil. Simmer over medium heat, uncovered, for 25 to 30 minutes. Turn off heat and stir in honey until dissolved. Let syrup cool at room temperature and chill. Preheat oven to 300˚F. Remove thawed phyllo from boxes and arrange on a work surface and cover with a damp kitchen towel. Melt butter in a medium saucepan and skim away and discard the foam from the top. Pour off the melted butter into another saucepan, leaving behind and discarding the water from the butter. Butter a baking sheet 18 X 13-inches. Arrange one layer of phyllo in pan and butter phyllo. Make 11 more layers in the same manner, being sure to butter the phyllo well. In a bowl combine walnuts, sugar, and cinnamon. 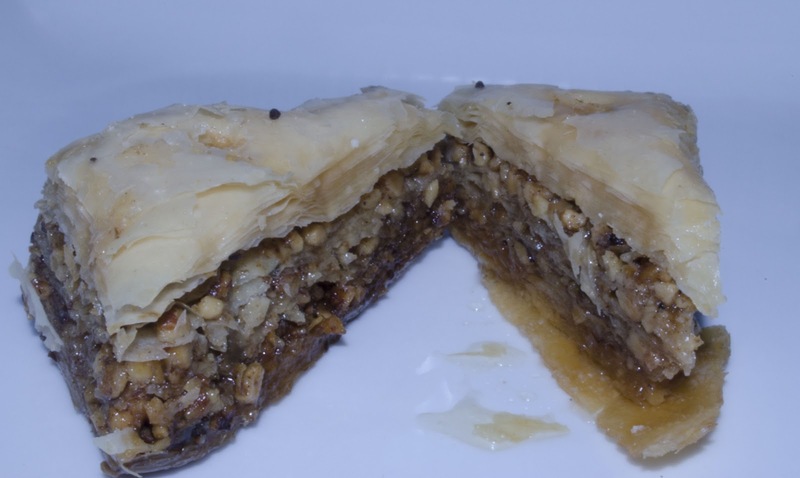 Sprinkle a cup of the nut mixture over the phyllo and top with three layers of phyllo, buttering in between each layer of phyllo. Continue to make more layers in the same manner until all the nuts are used. Arrange 14 sheets of phyllo over the last of the nuts, being sure to butter between each layer of phyllo well. With a sharp knife cut baklava into diamonds or triangles about 2 inches in diameter. Bake baklava in the center of the oven for 2 hours, or until golden brown. If the baklava browns too quickly reduce oven to 275˚ F. Remove from oven and immediately pour chilled syrup over hot baklava. Makes about 32 pieces of baklava. is to pour cold syrup onto hot baklava.